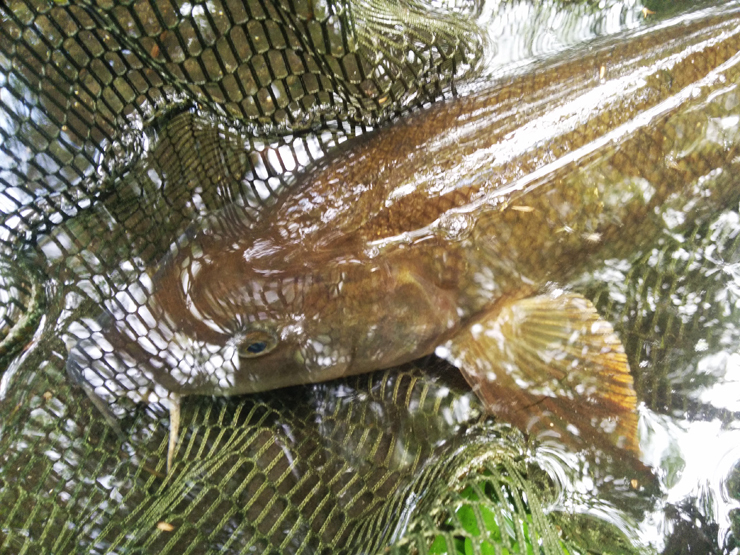 I wanted to replace my broken landing net like-for-like, but it has no brand name on it, the tackle shop where I bought it has changed hands and the three tackle shops I tried didn't have the same one. They had versions of the flip-net but each one was made of wire and plastic - I wanted metal and screws and hinges and weight. I don't mind paying £60 for a net that will last me 3 or 4 seasons, I don't want to pay £20 for one that will last me most of the afternoon. 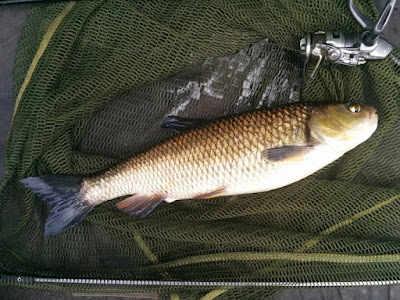 A new landing net is a real commitment, it's the last tool you need to complete the task at hand. The difference between a selfie with a fish and stamping and swearing and having a bad week. Plus new landing nets are unlucky - they have never landed a fish, perhaps it'll take weeks or months before they do. I settled on a Korum folding triangle net, needs to be assembled on arrival and needs a pole and I have to carry it about made up - but a decision had to be made. Time for a nice relaxing day's fishing. 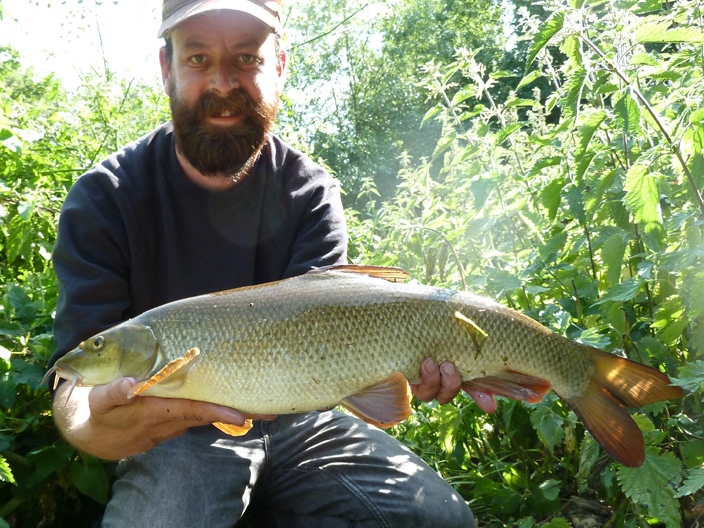 I wandered about looking for a barbel and spotted one between two weed beds and it wasn't long before it was safely in the net. About 4lb (top photo). Right, net works. 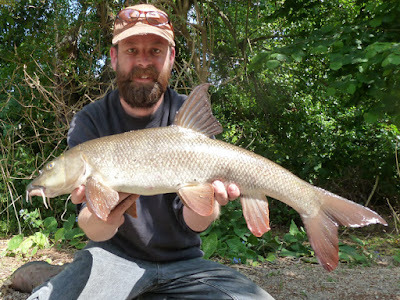 I had a good wander about fish-spotting, searching for both barbel and chub - and found them - some in places I wasn't expecting. A roll here and there produced four chub to about 3lb and five barbel (4lb, 1½lb, 5lb 4oz, 4lb and the best of the day 6lb (below). Great day, I quite like the new net! 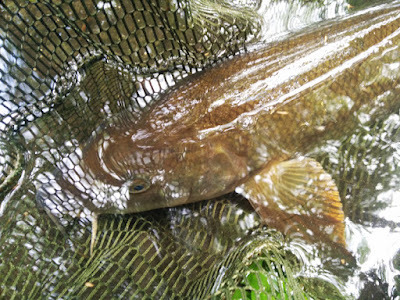 Those folding Korum nets are a great bit of kit. Mines has plenty of abuse over the last two years. Again was nice to meet you the other day. Seems like an age ago I was reading your Tooting Bec posts. Great to see you are still on the fish! Jury is still out on the net - all of my kit is used to destruction... A season is good. Nice to meet you to - how did you do? Just the chub that was on my first cast and the orange koi that was beaten up. Wading through I did manage to locate a shoal of very big chub. Hopefully I can get back down the river before they manage to scarper off. Missed this comment, good luck with the chub - probably see you around. Tis the angler that catches the fish. Someone told me recently that luck was merely opportunity meeting preparation.